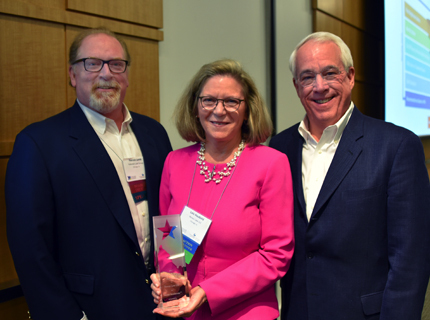 Congratulations to Novus Law LLC and Vorys, Sater, Seymour and Pease LLP, recipients of the coveted 2017 InnovAction Award. 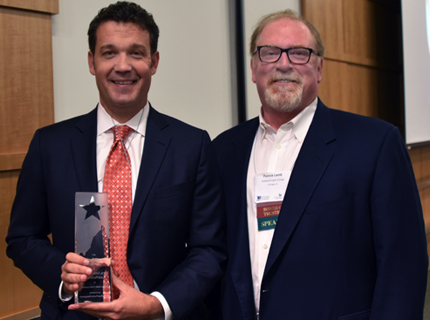 The awards were presented October 27 during a special lunch session at the College of Law Practice Management’s 2017 Futures Conference and Annual Meeting. InnovAction Committee Chair Patrick Lamb presented the awards to Novus Law’s Ray Bayley and Lois Haubold, and to Vorys partner Whitney Gibson. He also acknowledged InnovAction Awards Judges Ida Abbott, Tom Clay, Casey Flaherty, Merrilyn Astin Tarlton and Tony Williams, thanking them for their dedication to the process. The College has been honoring innovation in the legal profession since 2004. The InnovAction Awards competition spreads awareness both within and outside the legal profession of the changes occurring and coming. Browse the Hall of Fame to learn more about past InnovAction Award recipients. Pat Lamb (L) presents the Award to Lois Haubold and Ray Bayley. Novus Accelerate is a unique combination of process, technology, statistics, and decision analytics that delivers clients unprecedented insight into their matters with unprecedented speed so better decisions about their litigation can be made faster. The process to examine and analyze evidence is based on principles of Lean Manufac­turing that eliminate redundant and unnecessary work, and reduce mistakes, cycle time, and cost. This process, Novus One-Touch, accelerates time to knowledge for corporate clients, which is critical to making decisions, resolving matters, and reducing costs. The statistics include a multiple-regression algorithm that uses years of statistical data to forecast with statistically significant accuracy the number of key and hot documents that are in a body of evidence. This algorithm provides the confidence, within a statistical margin of error, that the story of “what happened” includes all of the important evidence. The decision analytics tool uses the theory of prediction markets, i.e., the Wisdom of Crowds, to provide clients with a probabilistically weighted view of the various possible outcomes for their matter that allows them to make strategic and financial decisions based on the story of “what happened” in their matter. Key Team Members: Whitney Gibson, Daren Garcia, Adam Sherman, Tyler Pensyl, Colleen Devanney, Leslie Allen, Meredith Caplan, Jordan Cohen, Laura Erdman, Blake Finney, Robert Grise, David Howell, Maureen Kelly, Bridget Sedlock, Dan Wucherer and Samuel Yamron. Pat Lamb (R) presents the Award to Whitney Gibson. As online marketplaces continue to grow in both size and number, an increasing number of products are sold online. The problem? Brands are benefiting from only a small and decreasing percent of those sales. For every legitimate seller, growing numbers of unauthorized sellers emerged for nearly every product — from batteries to skin lotion and from air conditioners to work boots. These unauthorized sellers of online goods were taking revenues from brand owners and demotivating companies’ e-commerce teams charged with growing their e-commerce sales. The unauthorized sellers also caused legitimate sellers to drop prices, the perceived value of products to erode, and angry authorized retailers to refuse to continue doing business with a company. Vorys entered a market full of separate entities spinning their wheels to help in any way possible. Vorys’ innovation was combining novel legal tactics with the abilities of cyber investigators and the efficiencies of technology. The Vorys program – for seemingly the first time — provides a truly comprehensive approach to help brands preserve their online brand equity. It not only helps remove unauthorized online products for sale, but also can stop them from returning by identifying and pursuing the source of the goods. Vorys now provides online seller enforcement services to more than 100 clients across the country, many of which are global brands. Our clients repeatedly say they were starving for a way to tackle this problem, and we discovered a way to help solve it. The InnovAction Awards are made possible through the generous support of our 2017 Sponsors. Please join us in thanking them!